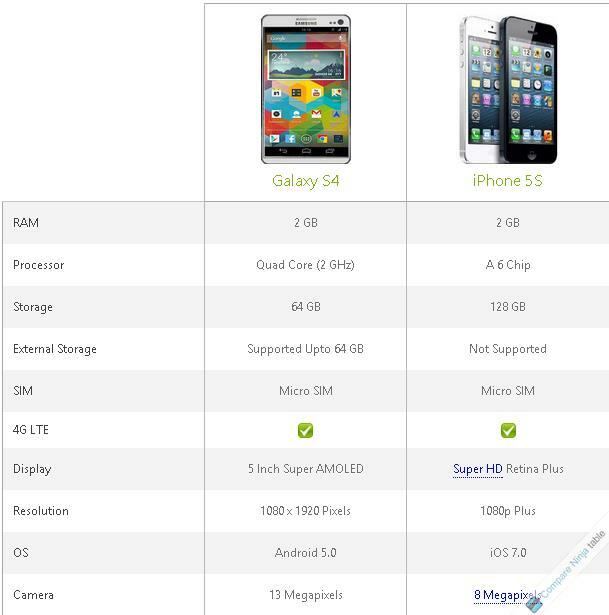 Here, i am comparing Apple iPhone 5S with Samsung Galaxy S4. The comparison is based of the technical specifications that are provided by outer sources. I am doing my best to review and compare these two devices. The given specifications are not 100% sure and are taken as 'Expected' features that experts suggests. Read On to explore these two devices. Apple iPhone 5S Launch and Tech Specs. On the other hand, Android and Samsung are rocking the world. Android's market share is increasing day by day and its already far ahead of its competitors. South Korea's Tech Giant Samsung is on Top in Smartphone and Electronics Devices. Now Samsung is rumored to launch its next Galaxy device that is Samsung Galaxy S4 in month of April. So its good to see how this Smartphones War goes.